The editors of Jet Fuel Review are excited to present our 13th issue! For those of you who are first-time readers of our journal, we are a student-run and faculty-advised literary journal that publishes contemporary poetry, fiction, creative nonfiction, and artwork each semester. 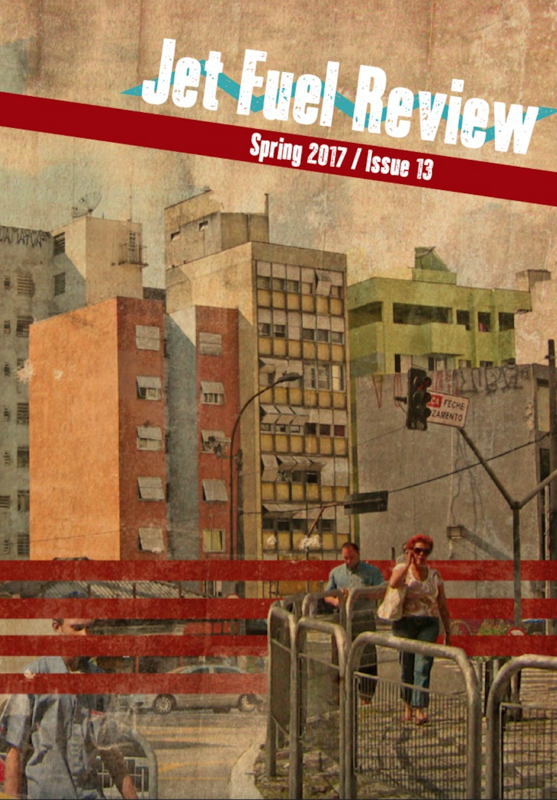 Affiliated with Lewis University, located southwest suburbs of Chicago, the editors of Jet Fuel Review are comprised of Lewis students, alum, and volunteers who all share a passion for spreading literature and art to the world. This semester, we reached one of our highest numbers of submissions as we read almost 500 different pieces in the span of a couple months. The selection process was difficult as usual because while we received a lot of fantastic work, we had to remain as curatorial as possible in order to publish the highest-quality array of work that we can. On the cover of this issue, you will notice a multimedia piece, “Street Scene: As the Sun Sets”, by Damon Locks, a Chicago-based visual artist and musician. With several other pieces of his featured within the issue, we are honored to publish his artwork this semester which pays tribute to the city of Chicago as Locks uses realistic shots of everyday life enmeshed with unique geometric lines and patterns in each piece to accentuate the grid-system of the city. Locks renders the day-to-day life of real Chicago residents in their habitual settings, highlighting the under-recognized beauty in the subtle and intriguing nature of human beings’ routinized lives. In the poetry section, we are honored to publish Cortney Lamar Charleston’s latest work that uses basketball as a metaphor for growing up, along with the experimental “loose cento-sestinas” of Roy G. Guzmán that are partly in Spanish. In the fiction section, we have a wonderful piece by Alyssa Zaczek that details the life span of an arsonist with fresh and captivating fire imagery and although we only have one nonfiction piece this semester, we could not be more pleased to publish Arielle Silver’s lyric essay that uses snapshots of a camping trip to describe the highs and lows of a marriage. Last, but certainly not least, the editors are proud to present our second High School Dossier in which we did a special call-out for high school student creative work. We received high school student work from across the continent (we have writers from Canada and India!) and while we appreciate the creativity and innovation of budding writers and artists, we had to make sure that the work of these students is able to stand against the work from the writers and artists in the other sections who been practicing their craft for years. In our High School Dossier, we are very excited to debut many newly published writers and artists while also having the opportunity to allow the young voices of the world to be heard. At Jet Fuel Review, the driving force of our publication is the quest to illustrate the diversity of human beings through the mediums of art and literature which is what we always keep in mind during our reading period. Human beings may be diverse in terms of gender, race, class, sexual orientation, etc., but these unique traits help us better understand exactly what it means to be human. With that being said, we hope you enjoy the wonderful work in this issue as much as we do.